Our Ryeland Ewe style sheep model is extremely realistic, in every area. This is one of the oldest British breeds going back seven centuries. A flock of these on your lawn will really get you noticed....and your neighbours talking! 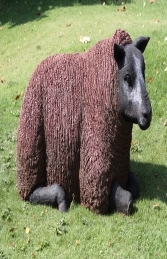 Our fabulous Ryeland Ewe is extremely life-like resin sheep statues. They look great individually or in a flock. Why not add one of our Merino or Texelaar sheep or lambs for a mixed flock!